Tired of the same old recipes on the grill? Or are you looking for something different and maybe healthier for dinner that still tastes good? Honey sriracha shrimp and pineapple. If so, than honey sriracha grilled shrimp is your answer! I fell in love with sriracha sauce several years ago when I was at my favorite Thai restaurant and they had it sitting next to the Hoisin sauce on the table. Curious as to what this unfamiliar condiment was, I put a little drop on my chopsticks and gave it a taste. 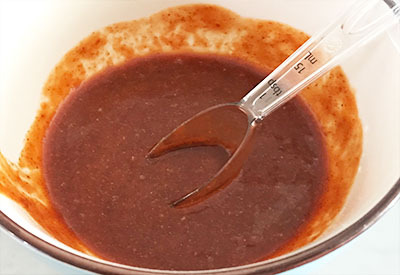 Honey and sriracha mixed with a few spices to give it extra depth of flavor. I was hooked!!!! Where had sriracha sauce been all my life? I now use sriracha sauce on a large majority of my dishes. It has such terrific flavor and it pairs well with sweeter recipes. I had first combined honey and sriracha sauce together when I ran out of buffalo sauce for my Instant Pot chicken wing recipe. Shrimp from the market ready to be peeled and deveined. I looked in the refrigerator to see what I could use instead and the sriracha bottle practically jumped out at me. I didn’t want it to be too spicy so I combined it with some local honey and magic was made! The wings were just spicy enough to let you know that they were there, but the sweetness of the honey quickly balanced out any threat of a leftover burn in my mouth. So when I picked up some raw shrimp at the market, and was looking to marinade them, I knew that I needed to try the combination again and make honey sriracha shrimp! A silicone pastry brush and BBQ grill pan makes this meal easy to make! I added a few extra spices to the marinade this time. I wanted the shrimp to have a little bit of smoke flavor because I knew that I would be grilling them. Smoked paprika is a great additional to any dry rub or marinade if you are looking for the taste that it has been in a smoker for hours. And to enhance the sweetness of the honey, I grabbed a fresh pineapple off my counter and decided to grill that as well. Cook the shrimp just until pink on both sides to avoid overcooking. You could take the time to place each shrimp and pineapple on a water-soaked wooden skewer if you wish. However, I find it much easier to use a grill pan and throw both the honey sriracha shrimp and pineapple together in the same pan! It takes much less time to prepare, and I don’t risk burning my hand as I try to turn the skewers over while grilling! But if you aren’t ready to grill your shrimp, try one of our favorite stove top recipes – Shrimp & Arugula Risotto! Honey sriracha glazed shrimp grilled to perfection with the sweet counter balance of grilled pineapple chunks. 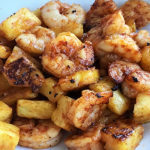 In a small bowl whisk together all the ingredients except for the shrimp and pineapple to make the marinade. 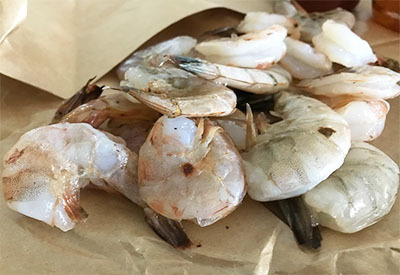 Add shrimp to a resealable plastic bag and drizzle marinade on top. Massage marinade into the shrimp being sure to coat each piece. Refrigerate for at least 30 minutes. 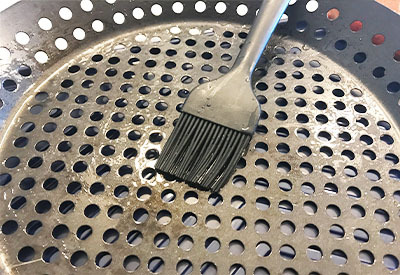 Brush olive oil onto a grill pan and once pan is heated, add the pineapple chunks. 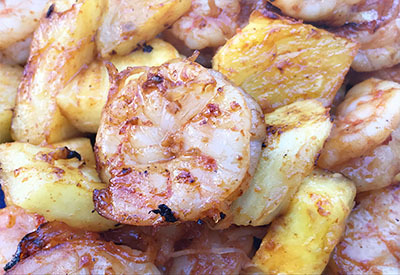 Immediately add the shrimp and marinade over top of the pineapple and grill on one side for 3-4 minutes. 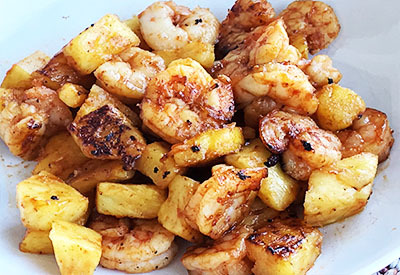 Flip shrimp and pineapple over and grill for an additional 3-4 minutes until the shrimp is pink and the pineapple begins to show grill marks. Serve immediately with rice, cauliflower rice, or as a stand alone main course.